I decided another ten minutes in bed would only make a minimal difference, I started the day by putting on my hiking gear. I hurried to brush my teeth and attempt to do something with my crazy, hot pink hair. By 4:30am, my travel buddy, Eric, and I were ready to rock Rainbow Mountain. We boarded the our bus, arranged by Bamba Experience, and headed outside the city of Cusco. A restless night before and the lulling of the tour bus quickly put me into a head-bobbing sleep. When I woke up, we were just entering the town of Pitumarca. In Pitumarca, we disembarked for a hot breakfast! All the tourists sat down at picnic style benches and food was immediately served. We ate a Peruvian porridge made from quinoa, banana pancakes, and of course tea made from coca leaves. The leaves are a native cure for altitude sickness. They even had a bowl of them at the Cusco Airport when we deplaned! With a hot breakfast in our stomach, the tour group became a bit more lively. We began to introduce ourselves to the people around us and share where we came from and how our trip to Peru was coming along. Our chatter was interrupted when they gave us the signal it was time to return to the bus and continue on our journey. The bus lumbered through the small village, and distance between the “adobe” houses grew greater and greater. As we continued, we saw the rolling hills filled with llamas, alpacas, and sheepdogs keeping watch over their herd. I took in the scenery as the bus began climbing the mountainous region. After 3 hours, we arrived at the trailhead for the hike to Rainbow Mountain. 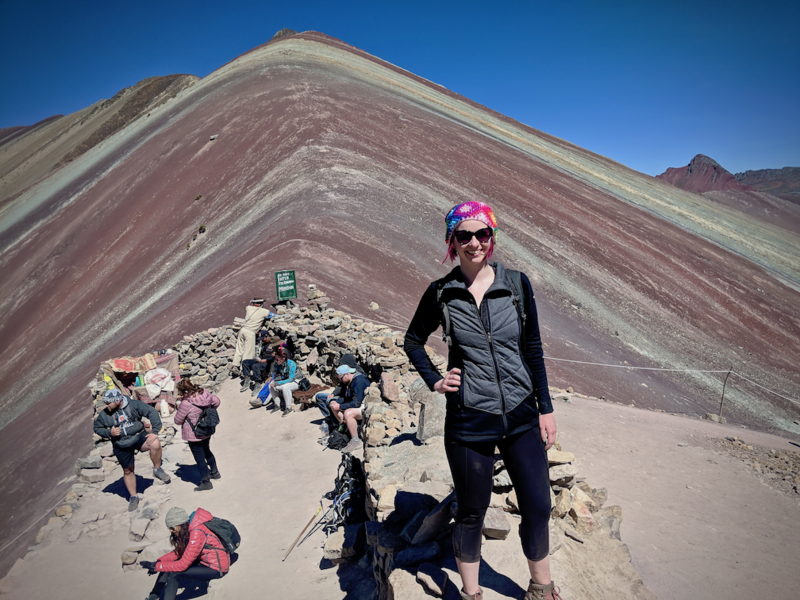 Within the last 5 years, the outside world only recently discovered Rainbow Mountain, or Vinicunca, at 20,945 ft. It’s a local favorite for the Quechua people who have used mountain as a place of worship and pilgrimage. The mountain is striped with colors of minerals from gold to maroon or green as far as you can see. After lathering up with sunscreen and heading towards the entrance, we could already feel the toll of the altitude on our bodies. Eric and I had a mutual understanding before we even left for the trek - if we needed to rent a horse to get to the top of Rainbow Mountain, we’d do it! Thirty minutes into the trek with labored breathing and heavy legs, we signaled for a horse. As you trek up the mountain, you’ll see many locals ready to offer you a steed at a moment’s notice. I think we arrived at the perfect time, because quite a few groups were descending, so there were plenty of horses and guides to choose from. With a quick nod of my chin, I had a horse by my side, ready to mount for 50 soles one way and 90 soles roundtrip (~$15 / $30). Now, you may think I’m lazy for copping out and hiring a horse, but sometimes, I prefer to be a lady of leisure. 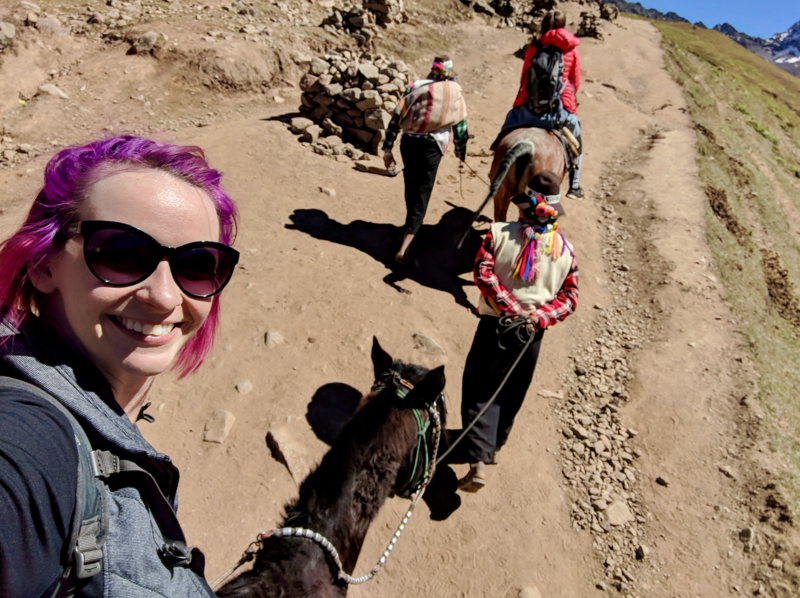 There is one part of the trek where you have to disembark from your trusty steed, because it’s too steep for the horse to climb with all the extra weight on it’s back. After getting through the tricky bit, I returned to my ride. 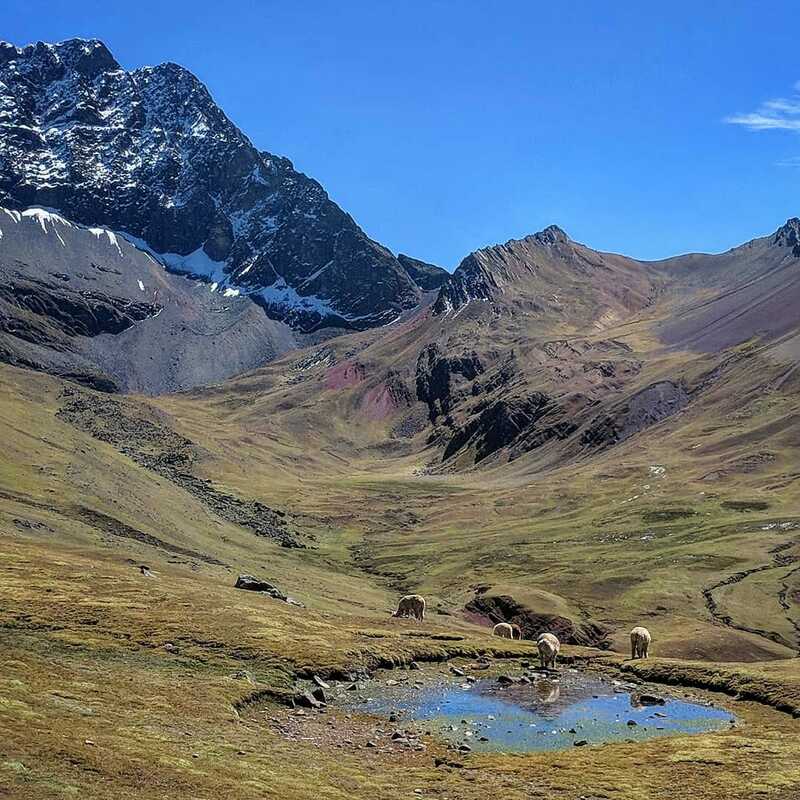 As we climbed, I admired the rolling hills, the melting Ausangate glacier, and the alpacas grazing next to the trek. I was brought back to reality, when the horse stopped and I was signaled to get off. The rest of the way Eric and I were forced to conquer ourselves. Fortunately, there wasn’t much of the steep mountain remaining before we got to the quintessential Rainbow Mountain shot. Most of the tourists took a right to get a view of the top of the mountain, Eric and I decided to hang a left and see what the path ahead had to offer. The trail continued to take us along the side of the mountain until we reached a clearing. A man with “official looking clothes” or maybe a local wanting to make some extra cash, told us it was 10 soles to pass. That’s the equivalent of about $3 USD, so without hesitation reached for my wallet. Ahead we walked out to a jutting edge that gave us 360 degree views of the beautiful mountain range. We took a few photos before heading back. When Eric and I returned to the “fork in the road,” I ventured to the top of the clearing to bask in the glorious view. Far too soon it was time to head back down the mountain and return to the tour bus. The downhill slope was much less taxing and I chatted with a new friend I met along the way. To celebrate another successful afternoon in Peru, we did a "cheers" with an ice cold Cusqueña, the popular Peruvian beer.. The guide corralled the stragglers from our group and we boarded the bus to return to Chilca for lunch. Being absolutely ravenous after our long day of travel and trekking, I was overjoyed when the waiters brought out a hot buffet of vegetables, chicken, fried potatoes and freshly squeezed fruit juice. I put as much food on my plate as socially acceptable and scarfed it down. After we had gorged ourselves with delicious Peruvian food, we got back on the bus to return to Cusco. Eric and I shared our photos and chatted about how we were going to miss Peru. I reflected on when how I planned to be on the defense, which is usually a necessity being female in other countries I’ve traveled to - like Egypt and India. 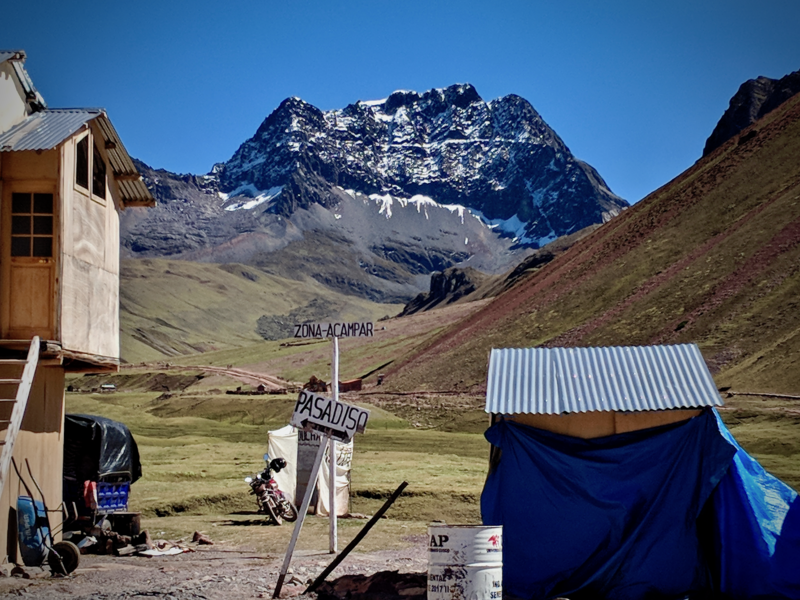 But in Peru, I only found jaw-dropping views and gracious hosts that were always willing to guide you in the right direction.